Cytokines, such as IL-6 and tumor necrosis factor (TNF)-α, have an important role in regulating estrogen synthesis in peripheral tissues, including normal and malignant breast tissues. The activities of the aromatase, estradiol 17β-hydroxysteroid dehydrogenase and estrone sulfatase are all increased by IL-6 and TNF-α. Prostaglandin E2 may also be an important regulator of aromatase activity in breast tumors. Macrophages and lymphocytes, which invade many breast tumors, are thought to be an important source of factors that can stimulate estrogen synthesis in malignant breast tissues. The co-ordinated stimulation of the activities of the enzymes that are involved in estrogen synthesis offers an explanation for the high concentrations of estrogens that are present in breast tumors. Considerable advances have been made in recent years in understanding the genetics and molecular biology of breast cancer, but for women in most western countries, breast cancer still remains a major cause of death. The majority of breast tumors are initially dependent upon estrogen to support their growth, with the highest incidence of breast cancer occurring in postmenopausal women at a time when ovarian production of estrogens has ceased. In this group of women estrogens continue to be produced in extraglandular (i.e. non-ovarian) sites, such as adipose tissue  but also in normal and malignant breast tissues . There is now convincing evidence from a number of studies that concentrations of the biologically active estrogen, estradiol, are higher in malignant than in normal breast tissue [3, 4]. Furthermore, the levels of estradiol that are detected in breast tumors are 50 to 100-fold higher than the concentrations of this hormone that are found in the circulation of postmenopausal women. The high estradiol concentrations found in breast tumors could arise either due to uptake from the circulation or from in situ synthesis. As similar concentrations of estradiol are present in tumors with or without estrogen receptors, in situ synthesis is now considered to be the major pathway by which tumor estrogens originate. In this paper we review the evidence implicating cytokines, and other factors, in regulating the activities of the enzymes that are involved in estrogen synthesis in breast tissues. The identification of cytokines as having a critical role in regulating estrogen synthesis in peripheral tissues has suggested mechanisms by which some known risk factors for breast cancer (e.g. obesity, stress) may act to increase estrogen synthesis within the breast. Three main enzyme complexes are involved in the synthesis of estrogens in peripheral tissues: aromatase is responsible for the aromatisation of androstenedione to estrone; estrone sulfatase (E1-STS) catalyses the formation of estrone from estrone sulfate; and estradiol-17β-hydroxysteroid dehydrogenase (17β-HSD) Type 1 is responsible for the reduction of estrone to the biologically active estrogen, estradiol. In addition, other enzymes, including 17β-HSD Type 2 which inactivates estradiol, and estrone sulfotransferase, which renders estrogens inactive through sulfate conjugation, are also important in regulating the tissue-specificity and ligand availability of estrogenic hormones. The aromatase enzyme, CYP19 P450(AROM), belongs to a family of P450 enzymes . In post menopausal women it is located mainly in adipose tissue but is also present in normal and malignant breast tissues. Immunocytochemical studies to examine the location of aromatase in breast tumors have provided evidence for a stromal  and epithelial location . Measurements of aromatase activity in fibroblasts derived from breast tumors or MCF-7 cells, however, have revealed a much higher level of aromatase activity in fibroblasts . Aromatase activity in breast tissues is relatively low, and there has been considerable debate as to whether sufficient estrogen could be produced to evoke a biological response (i.e. stimulate tumor growth). Studies in women with breast cancer revealed, in fact, that a major proportion of breast tumor estrogen is synthesized in situ and that this is almost completely abolished by the potent aromatase inhibitors that are now in clinical use . A breakthrough in understanding the control of aromatase activity in breast cancer was made by Miller and colleagues . They were the first to show that the location of a tumor within the breast influenced aromatase activity in the quadrant in which the tumor was located. This finding, which was subsequently confirmed at the expression and activity levels, suggested either that tumors developed in an area of high aromatase activity within the breast or that tumors were capable of producing factors that stimulated aromatase activity in adjacent tissues. Over the last decade many studies have been carried out to identify potential aromatase stimulatory factors. The analysis of breast cyst fluid initially led to the identification of several factors that could stimulate aromatase activity; IL-6 was the most potent factor detected . Cultured fibroblasts derived from normal or malignant breast tissue were also found to be a rich source of IL-6. The ability of IL-6 to stimulate aromatase activity was subsequently shown to be markedly potentiated by the IL-6 soluble receptor . This soluble receptor is produced by fibroblasts from malignant, but not normal, breast tissue, malignant breast epithelial cells and cells of the immune system . Other cytokines and growth factors that can stimulate aromatase activity include TNF-α, oncostatin M, leukaemia inhibitory factor and insulin-like growth factor Type I . The aromatase gene is expressed in several tissues in the body (e.g. ovary and placenta) in addition to peripheral tissues. It is now known that expression of the aromatase gene is regulated in a tissue-specific manner by the use of alternative promoters . In adipose tissue its expression is regulated mainly from promoter (P) I.4; PII and PI.3 have lesser roles . The 5'-upstream region of PI.4 contains a glucocorticoid response element and an IFN-γ activating sequence element which can bind transcription factors of the 'signal transducer and activator of transcription' family . Cytokines, in the presence of glucocorticoids, regulate aromatase gene expression via the PI.4. In malignant breast tissue the important observation was made that promoter switching occurred such that aromatase gene expression is regulated by PII and PI.3 to a greater extent than PI.4 [18, 19]. Expression from PII and PI.3 is regulated by cAMP and factors that regulate cAMP levels. Prostaglandin E2 (PGE2) is thought to be an important regulator of aromatase gene expression via PII and PI.3 . Although the mechanism by which promoter switching in malignant breast tissue occurs remains to be elucidated, it is likely that the use of alternative promoters confers a growth advantage on the tumor. Studies are currently in progress to determine the relative abilities of IL-6 and PGE2 to simulate aromatase activity in fibroblasts derived from normal and malignant breast tissues. Regulation of aromatase activity in malignant tissues, however, is likely to be highly complex. It has recently been found that PGE2 may act, at least in part, by stimulating IL-6 production in fibroblasts derived from normal and malignant breast tissues . Much of the estrone derived from androstenedione is converted to estrone sulfate by estrone- and phenol-sulphotransferases. Estrone sulfate is hydrophilic and circulates at much higher levels than that of the unconjugated estrogens and acts as a reservoir for the formation of active steroids via the action of estrone sulfatase (E1-STS). Expression of E1-STS mRNA is much higher in malignant than in normal breast tissue . The determination of E1-STS mRNA expression in breast tumors has prognostic significance and a high level of expression is associated with a poor prognosis . E1-STS belongs to a family of 11 sulfatase enzymes but only one steroid sulfatase is thought to exist which is able to hydrolyse both aryl (e.g. estrone sulfate) and alkyl (e.g. dehydroepiandrosterone sulfate [DHEA-S]) substrates. Recently DHEA-S was shown to be a potent stimulator of the growth of MCF-7 breast cancer cells . The DHEA-S stimulated growth of these cells could not be blocked by aromatase inhibitors. This finding provides convincing evidence for an alternative pathway by which the growth of hormone-dependent tumors might be stimulated. DHEA-S is converted to DHEA, by steroid sulfatase, and DHEA can be subsequently reduced to androstenediol, a steroid with potent estrogenic properties. Research into the regulation of E1-STS expression and activity is still in its infancy. While cytokines such as IL-6 and TNF-α can increase the activity of this enzyme, no effect of these cytokines at the expression level has so far been detected . Thus, these cytokines may act to increase post-translational modifications of the enzyme. Alternatively, it has been postulated that IL-6 and/or TNF-α may affect membrane permeability, thereby increasing substrate availability and hence enzyme activity. Estrone can be formed as a result of aromatase or E1-STS activity but to achieve its full biological potency it must be reduced to estradiol; this reaction is mediated by 17β-HSD Type 1. There are 9–10 members of the 17β-HSD family of enzymes, which regulate ligand availability to either the estrogen or androgen receptors . Other reactions catalysed by members of the 17β-HSD family include the reduction of DHEA to androstenediol (Types 1 and 5), androstenedione to testosterone (Types 3 and 5) and the inactivation of estradiol (mainly Type 2). When high estradiol concentrations were initially detected in breast tumors it was not readily apparent why such high levels should exist in tumors. The overall peripheral metabolism of estrogens strongly favors the inactivation of estradiol rather than the conversion of estrone to estradiol. Using an isotopic infusion technique in women with breast cancer, estrone was found to be preferentially converted to estradiol in tumor tissue . A search for factors that could preferentially stimulate the conversion of estrone to estradiol identified IL-6 and TNF-α as key regulators [28, 29]. In addition, insulin-like growth factor Type I and an albumin-like molecule isolated from breast tumor cytosol, were also found to regulate the conversions of estrone to estradiol . In MCF-7 breast cancer cells most cytokines and other factors have been found to preferentially stimulate the conversions of estrone to estradiol. In another breast cancer cell line, ZR-75-1, IL-4 and IL-6 were found to markedly stimulate the inactivation of estradiol, thus the effects of cytokines on 17β-HSD activity vary in different cell lines . However, in view of the increased conversion of 3H estrone to 3H estradiol detected in breast tumors  and the high estradiol concentrations in tumors [3, 4], it would appear that overall cytokines must act in vivo to stimulate estrogen synthesis. It is now evident that cytokines, growth factors and PGE2 have crucial roles in regulating estrogen synthesis in breast tumors. 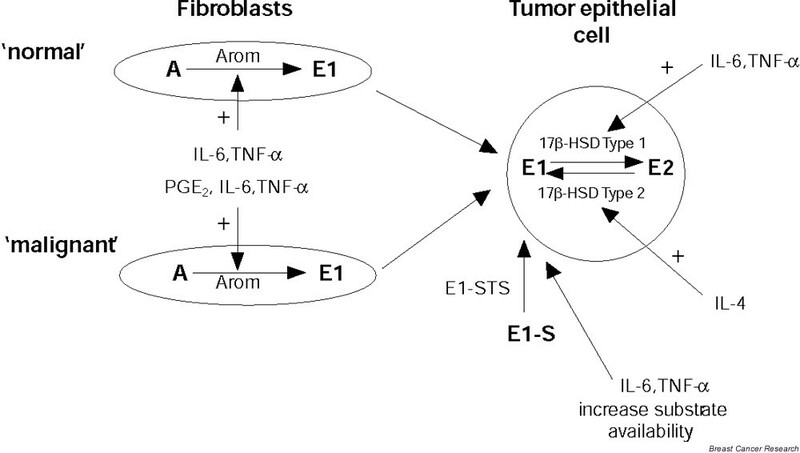 IL-6 and TNF-α can stimulate the activities of all the enzymes involved in estrogen synthesis; PGE2 is important in regulating aromatase gene expression in malignant tissues (Fig. 1). It is likely that the activities of the aromatase, E1-STS and estradiol dehydrogenase Type1 are increased in a co-ordinated manner by the actions of cytokines and PGE2. Such a mechanism may account for the high concentrations of estradiol that are detected in breast tumors. Estrogen synthesis in breast tissues. Three enzyme complexes are involved in estrogen synthesis in breast tissues: (1) Aromatase (Arom) which converts androstenedione (A) to estrone (E1); (2) estrone sulfatase (E1-STS) which hydrolyses estrone sulfate (E1-S) to E1 and (3) estradiol-17β-hydroxysteroid dehydrogenase (17β-HSD) Type 1 which reduces E1 to the biologically active estrogen, estradiol (E2). 17β-HSD Type 2 is involved in the inactivation of E2. Higher levels of aromatase activity are detected in stromal fibroblasts. In 'normal' breast tissue, aromatase gene expression is thought to be regulated to a greater extent by promoter (P)I.4 expression, which is stimulated by cytokines such as IL-6 and tumor necrosis factor (TNF)-α. In malignant breast tissues, aromatase gene expression is thought to be regulated to a greater extent by PI.3 and PII, expression of which is stimulated by cAMP and factors such as prostaglandin (PG) E2, which increase cAMP levels. Cytokines such as IL-6 and TNF-α also increase 17β-HSD Type 1 activity, while their effect on E1-STS activity may be indirect. The important role that cytokines have in regulating breast tumor estrogen synthesis stimulated research into the origin of such factors. There is convincing evidence that IL-6 is produced by fibroblasts derived from normal and malignant breast tissues. Conditioned medium collected from lipopolysaccharide-stimulated monocytes and lymphocytes was also found to markedly stimulate aromatase activity in breast-tissue-derived fibroblasts . This finding suggests that these cells may be an important source of stimulatory cytokines. Recent studies by Daynes  and Rook  have investigated factors involved in regulating cytokine production by Th cells. Their studies have suggested that the balance of the adrenal androgen, DHEA, to that of glucocorticoids determines the type of cytokines produced by Th lymphocytes. Th cells can progress to either a Th1 or Th2 phenotype and each type of Th cell secretes a characteristic profile of cytokines; IL-6 is produced by Th2 cells. High levels of DHEA are associated with a Th1 response while a predominantly glucocorticoid environment promotes a Th2-type response. Production of DHEA starts to decline at about the age of 25 years and thus in older subjects there is a switch from a Th1- to Th2-type of environment. IL-4 is a Th2-type cytokine and has been shown to induce 3β-HSD/isomerase activity in breast cancer cells which increases the conversion of DHEA to androstenedione . As androstenedione is a substrate of the aromatase, this could be another mechanism by which cytokines increase estrogen synthesis in breast tumors. Activation of the immune response and inflammation may also support tumor formation by inducing a Th2-type response . In addition to the role that IL-6 has in stimulating estrogen synthesis, it is also a pro-angiogenic factor, supporting the growth of new blood vessels that are essential for tumor growth. The identification of cytokines as having an important role in regulating estrogen synthesis in breast tissues has provided new insight into understanding some aspects of the etiology of breast cancer. It is well established that breast cancer occurs more frequently in older, postmenopausal women and that obese postmenopausal women are at an increased risk of developing breast cancer. Several studies have now shown that plasma IL-6 levels increase with aging . It is possible that the decrease in DHEA production that occurs with aging induces a Th2-type cytokine response that is associated with increased production of IL-6. There is also evidence that production of IL-6 and TNF-α may be influenced by body weight . The peripheral conversion of androstenedione to estrone is increased in older, overweight subjects. It is now apparent that changes in cytokine production that are related to obesity and aging, by increasing aromatase, E1-STS and estradiol dehydrogenase Type 1 activities, may account for the increased peripheral production of estrogens in such subjects. Although controversial, there is evidence that stress may also increase the risk of developing breast cancer . By increasing glucocorticoid production, stress favors a Th2-type cytokine production and an increase in IL-6 levels. The incidence of breast cancer is reduced in immunosuppressed women . As cytokine production is also reduced in immunosuppressed women, this finding supports the concept that cytokines have an important role in breast cancer, possibly acting via stimulation of estrogen synthesis [39, 40]. A major stimulus to identifying the factors that regulate estrogen synthesis in breast tumors is the insight that such knowledge may aid the development of novel drugs for the prevention or treatment of breast cancer. Preliminary investigations have already revealed that it may be possible to use small peptides or IL-6 variants to block the ability of IL-6 to stimulate aromatase activity. If the adrenal androgen, DHEA, does have an important role in regulating the Th1:Th2 balance it would seem appropriate to examine whether the administration of this steroid can be used to promote a Th1 response. Alternatively, it may prove feasible to devise an immunisation strategy that would favor a Th1-type response. In view of the relatively short-term responses for most current therapies, the development of such novel strategies may offer new hope for the treatment of breast cancer.